Peter smiled and sipped some of his wine. — Have you ever been to New York, Julia ? Lost in her thoughts, Julia was playing with her glass. — Yes, a long time ago… In 1984. — Well, that takes us a while back. — It was my first time in the USA. I was travelling with my father. We were supposed to spend two days in New York and then go south. People had said to me: “You’re going to love it or hate it, there’s no in-between”. At the airport I was already suffocating with the summer heat. Everything seemed bigger, further, weirder. As always, the hotel room was posh and dull. — I don’t think you can complain about too much luxury, Julia ! — You don’t get it. I would rather have had less comfort and more feelings. Less walls and more people. At home I used to get up in the middle of the night to wander in the city. Once I ended up early morning sharing a cup of coffee in a lost bar with prostitutes and flowers sellers, all totally faded after a long wasted night. Well, I felt more in the right place at that moment then stranded in that posh hotel room in New York. — So, you didn’t like the experience at all ? — I wouldn’t put it that way. But the trouble was, my father had his mind set on an itinerary and I had no choice but follow his predictable arrangements. I remember I lied down on the grass in Central Park but even nature seemed out of place in this megacity. I had the feeling we were walking for hours and getting nowhere. — You must have enjoyed some stuff, though. — Yes, indeed. I was fascinated by the skyscrapers at the foot of which homeless people were sleeping on the pavement surrounded by dirty flying papers. I wanted to go up high in order to get a different picture. I had always wanted to go on top of the Empire State Building but my Father did not agree. He said that we had come such a long way we ought to go on top of the highest building. In a distance, I had given a mean look at the two twin towers of the World Trade Center. I really thought they were ugly and didn’t want to go up there. — My Father was long dead when the twin towers sent me a message. — What do you mean by that? — On Sepember 9th 2011, I was not in New York, I was at work. When the plane crashed everyone was in a shock and they let us go back home. When I got back I picked up my mail and turned on the t.v. On-screen, the towers had collapsed and I froze. In my hand I held a postcard sent by a friend gone on holiday. 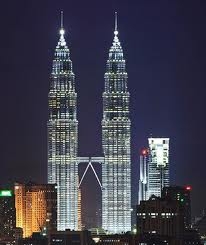 It pictured the two twin towers Petronas in Kuala Lumpur, Malaysia. Given the turn of events, these towers were now the highest ones in the world. It felt like an electric shock! The message on the postcard said:”There’s a light that never goes out”.